Belted Galloway beef raised on farm pastures and farm-grown hay with no supplemental hormones or antibiotics. Cattle come into the barn for their evening treat of grain to facilitate handling but are primarily grass fed. Meat is processed at a USDA inspected facility and beef cuts are available frozen year round. Baled hay available as long as supply lasts. Fresh eggs from a free range flock $3 a dozen. The all natural ingredients in Lydia's Beeswax Handcream will protect and soothe chapped hands. No dyes or perfumes to irritate sensitive skin. Pure Grade A native honey sold by the pound or half-pound jar. 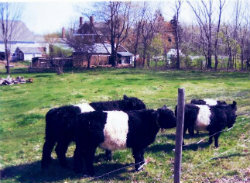 The Darius Frink farm, listed on the National Register of Historic Places, is located in the Newington Center Historic District and has been continuously operated by the family since 1837. The barn was rehabilitated with grant funding from the New Hampshire Division of Historic Resources in 2012. An agricultural conservation easement protects the farmland from development. All products sold at the farm. Please call ahead: 603-436-3763.